26.2 Quest: Summer is on the way! Great stuff. It's going the other way for us! mar - thanks for stopping by - yea, it was sticky.it was getting dark here earlier, but now it is sunny. I hear we are going to get slammed tonight which means you will get it sometime over night as well huh? Andrew - I guess that is how it goes over there in NZ huh? But, when we are freezing you are suntanning. So you have a hot Christmas each year huh? Great blog! I am running a marathon this weekend and I hope the heat holds off! Dude! You're lookin' skinny! Well done in the heat. 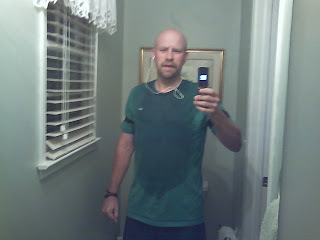 I'm looking forward to the day of running in the summer... though not dreadful heat and humidity.